this page provides the overall index of this web site. The list does not cover all the churches of Rome, not even all the churches within the walls, because some chapels inside palaces or religious institutions are not listed. 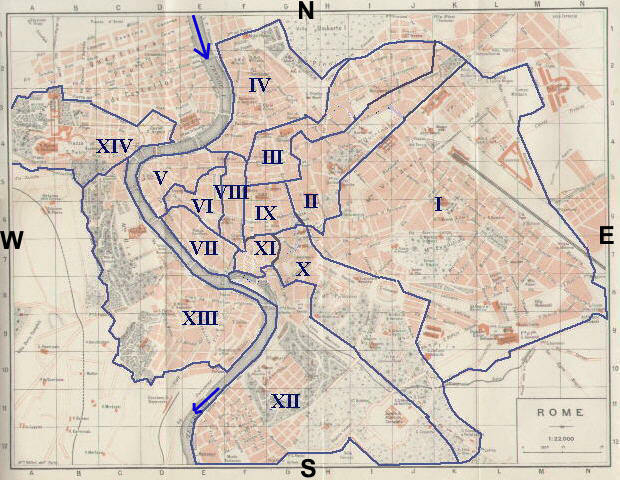 The districts of Rome were defined in a precise manner in 1743 by Pope Benedict XIV. The area inside the walls was divided into 14 districts called Rioni. One of the criteria followed in the definition of the districts was to have an even distribution of the population, at the time grouped near the river. This explains why the area of the rioni is so different. Today the same area is divided into 21 districts.